Imagine for a moment that you could have — be — or do — anything. That’s right. Imagine that it’s real. Imagine that you could have it all. You are in that position now. It does not matter who or what or where you are. Each of us can climb out of where we are and become something more. The past doesn’t matter — what does matter is what you’re going to do with what is before you. Whatever it is. You can. So make a good choice. No. I take that back. Make the best choices you possibly can for you. And you might be surprised what you can accomplish. This entry was posted in Jeremy Eveland and tagged Jeremy Eveland, making good choices, mental block on May 4, 2017 by admin. 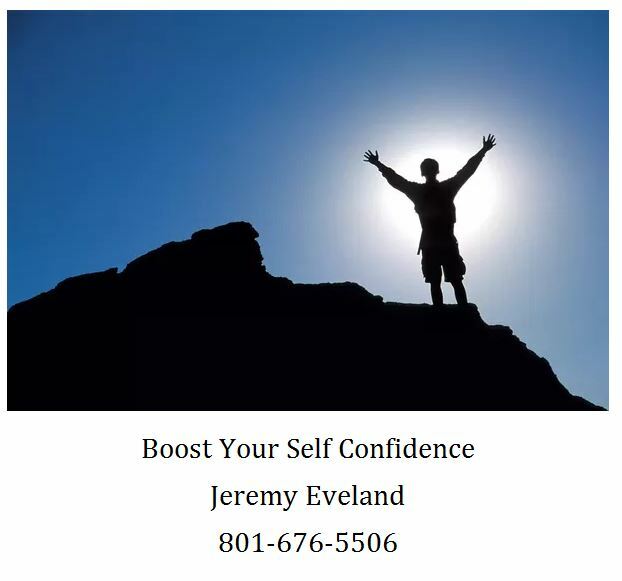 The real foundation of self-confidence is living a life consistent with your innermost values and principles while thinking and acting in harmony with your highest aspirations. What is it that you value? Do your goals reflect your values? What are the principles that you believe in? Can you articulate them without stuttering? What is it that is important to you? Do you live your life based on your principles and values? Moment to moment, each day, are you living your life by design or by default? If you’re not, what are you doing to change now? By the way, how are your 2017 goals coming along? How are those new year’s resolutions? Have you achieved them yet? Who is to blame if you haven’t? Head’s up – next month will be 1/2 way through the year. I’ve heard that most people overestimate what they can do in a year and underestimate what they can do in 5 years. Do you have a 5 year plan? If not, what are you going to do about it? 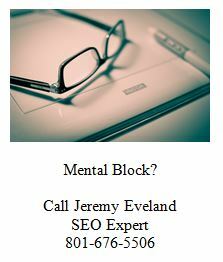 This entry was posted in Jeremy Eveland and tagged Jeremy Eveland, jeremy eveland seo expert on May 3, 2017 by admin. Mr. Alan R. Stewart Attorney in Salt Lake City Utah has announced the launch of his website http://www.alanrstewart.com. Having a website is a must these days; no matter what one's profession is. Stewart is excited for how this website will help his clients. I do believe that they will find it more convenient to reach me with a few clicks, even if it is in the middle of the night said Mr. Stewart. Alan Stewart has an amazing record of success in helping others get justice. Now he is looking to reach out to a wider section of people through his website. His decision to have a professional website done was not really a choice, but one of necessity to keep up with all the searching done on the internet for an attorney or lawyer in the Salt Lake City area. Alan Steward is an eminent attorney. He has been practicing law for over 20 years as an attorney in Salt Lake City Utah. He is a professional, an expert in multiple niches of law including divorce, personal injury, pre-nuptial agreement, family matters, probate etc. Everything was settled to my satisfaction, and my divorce was final within 3 months. You wont find a better attorney to make sure your needs are met when going through a divorce. I would highly recommend him to anyone who needs an attorney in a personal injury case. Alan R. Stewart has been offering his legal services in various areas that include Salt Lake City, West Valley City, West Jordan, Murray, South Salk Lake, Midvale, Alta, South Jordon, Sandy, Herriman, Holladay, Murray and more. He is very successful at helping people with their individual cases. Legal cases are often criticized for the languid process; justice delayed is equivalent to justice denied. Long procedural work frustrates people and consumes their savings. Alan R Stewart ensures that he will always try his best to settle legal matters as quickly as possible. Says Stewart, I will go the extra length to make sure that you, the people who have relied on me to solve your legal problems will get justice within a short time span; whatever complexities are involved in the proceedings. I am obliged to rise up to your expectations by serving your cause with my best possible efforts. This entry was posted in Jeremy Eveland on May 2, 2017 by admin. How important is it to be grateful? It’s extremely important to be grateful for what you have. I have a family of friends. These friends have in their house a quote or saying above the front door to their house. What if you woke up tomorrow morning with only those things that you thanked God for last night? Crazy to think about, right? We ought to be more thankful. I ought to be more thankful. There is always something that we should be thankful for. 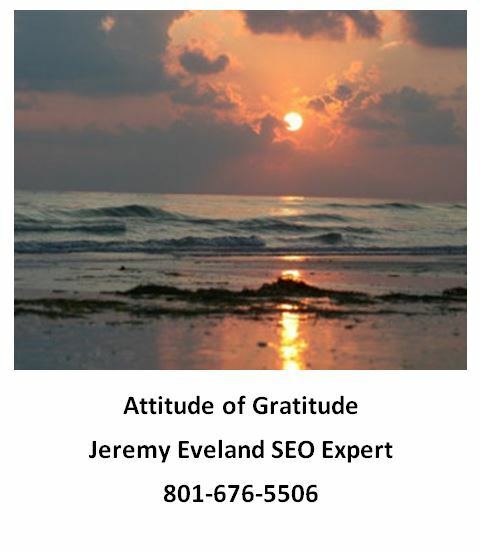 This entry was posted in Jeremy Eveland and tagged Jeremy Eveland, jeremy eveland seo expert on May 2, 2017 by admin.